Satellite systems have been used recently to extend geographical coverage of cellular service; however, the additional satellite capacity may also be used to off-load congestion within the area covered by the terrestrial network. 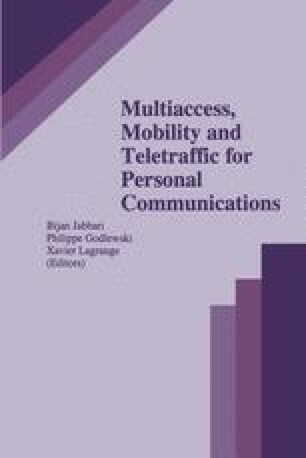 In this paper we investigate the performance (in terms of call-blocking probability) of such a hybrid satellite-terrestrial system. The footprints of a satellite with multiple spot beams may be viewed as the highest layer overlaying a multilayered cellular system. While such hierarchical schemes have been well studied, the effects of the large size of the footprints and the different reuse constraints on satellite bandwidth as compared to conventional terrestrial cellular networks, require different trade-offs that are investigated here. We present a model for a 1-dimensional (e.g highway) cellular system that is augmented by multiple spot beams and we obtain results for the call blocking probability. We then use an elaborate simulation program to study the call blocking probability and handoff blocking rate in a planar cellular network supported by satellite spot beam coverage. The effect of different hierarchical positions of the satellite system and the cellular system in the integrated system are also investigated (i.e., we consider the relative priority assigned to the cellular and satellite systems by the policy used to direct new call requests and handoffs).